Blended concessional finance, the combination of concessional funds with other types of finance on commercial terms, has great potential to mobilize capital and accelerate high-impact private sector investments in new and challenging markets. Yet full development of these efforts requires strong governance. 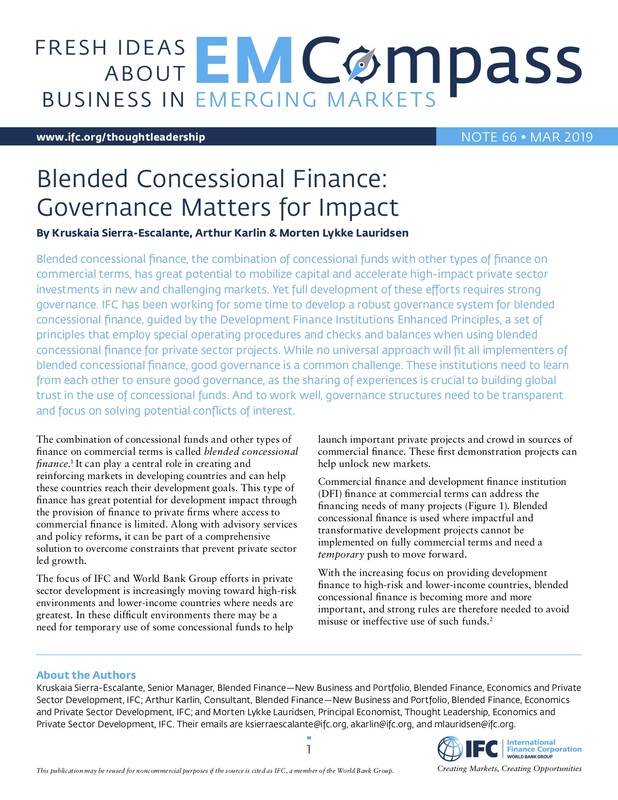 IFC has been working for some time to develop a robust governance system for blended concessional finance, guided by the Development Finance Institutions Enhanced Principles, a set of principles that employ special operating procedures and checks and balances when using blended concessional finance for private sector projects. While no universal approach will fit all implementers of blended concessional finance, good governance is a common challenge. These institutions need to learn from each other to ensure good governance, as the sharing of experiences is crucial to building global trust in the use of concessional funds. And to work well, governance structures need to be transparent and focus on solving potential conflicts of interest.